It really does hug the river if that last shot is anything to go by. Holy Ganga! Wes, this is incredible. 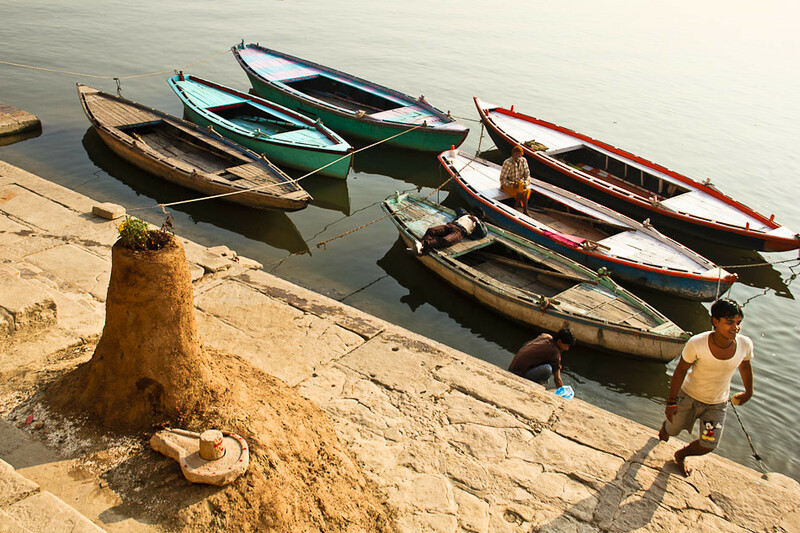 I cannot recall the last time I saw such positive pictures of the ghats at Varanasi! Great timing too! 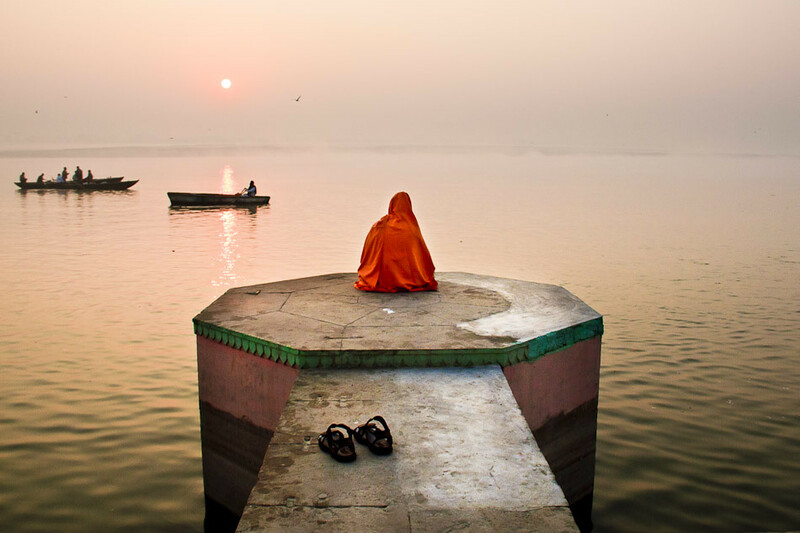 Awesome set of photographs, I have yet to go to India, but I’m planning for a trip there and Varanasi is high on the list. 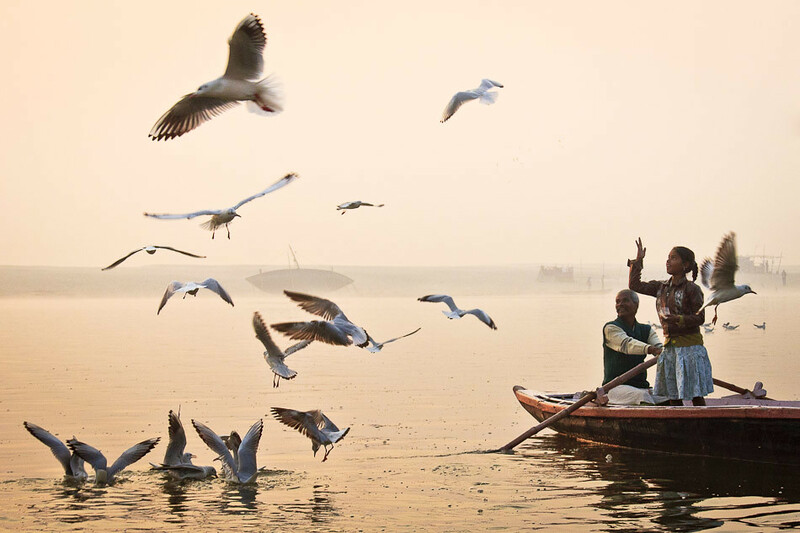 These photos really give me a feel for the place… I love the picture of the girl feeding the birds from the a boat (assume that is what she is doing…). Yeah, she was feeding the gulls. Some boats were surrounded by hundreds of birds – it was a bit crazy. I love the magic in the second photo. The expressions of joy are priceless. Fantastic photos. Isn’t the light at dawn amazing? I just posted some pictures from Varanasi yesterday. 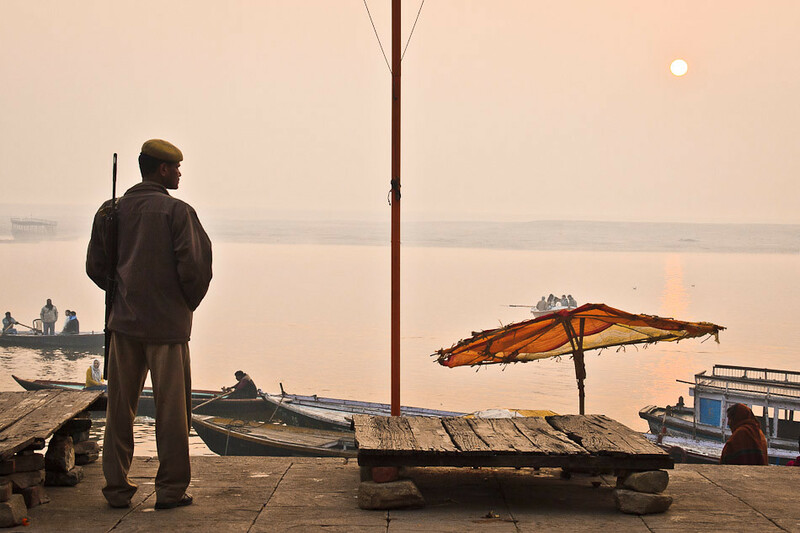 The interplay of light, color and faith at Varanasi is fascinating. Thanks, Jennifer. It’s an incredible place. WOW…..I really regret missing this place my last trip…I certainly have to go back. Your pictures are absolutely beautiful. Best ones yet. I keep saying that, but it’s true. Your best photos yet by far. Unbelievable job… Keep up the good work! Thanks, Ryan – I’m really happy with these. Gorgeous photos. I love the second one. It really looks like a whole other world or time! You already know this, but I’m going to say it again anyway, you’re a fantastic photographer, Wes. I always judge the pics that people display on their travel blogs by comparing them to magazine photos to decide how good they really are and yours are definitely of professional quality. Not many people can do this. Absolutely brilliant! 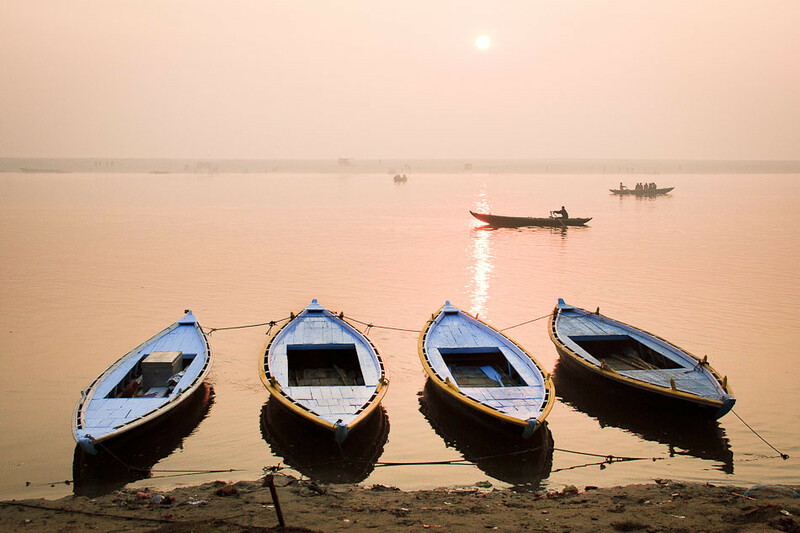 I personally love Varanasi. It’s definitely the most magical place in India and one of the most magical places I have ever seen. It really is like stepping back in time, isn’t it? I love these photos…the light is so warm and the vibe, so beautiful. 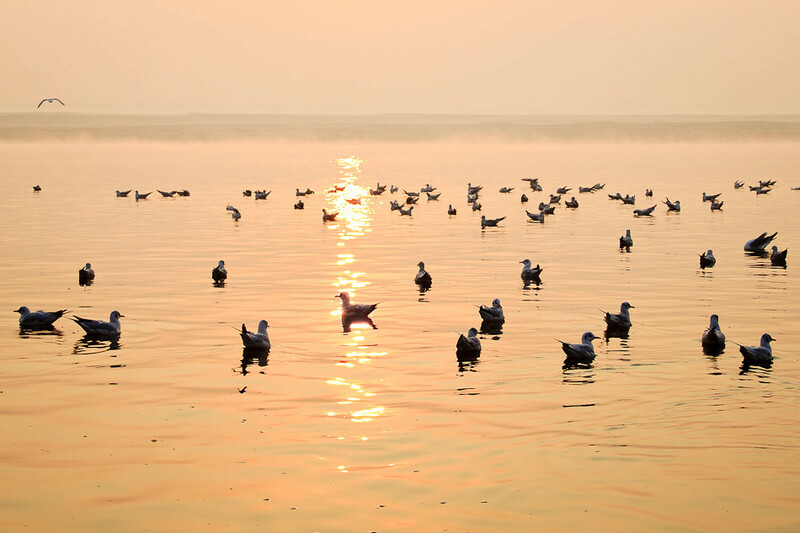 I feel like I’m right there in Varanasi, enjoying the sunrise. Thanks for the vicarious–and beautiful–journey! PS: If you aren’t already, you should be working for National Geographic! Awesome pics bro! Makes me think of kodachrome, but of course you probably don’t have much use for that (plus I think they just discontinued that film). Keep up the good work, and try to send some stuff to National Geographic…or maybe at least that Kodak contest they co-sponsor. How much more time on your walk-about? Thanks, Chris! I’ve got the budget for another 6 months or so. Hard to say, as I do some freelance work from the road and the site is starting to generate a wee bit of income. Hoping to stretch it! Yes, it is a special place. And these are beautiful images. We arrived there late at night to see the nightly ceremony they have to honor the river. It was an incredible sight. I was out of batteries- by the time we made our way to the river. Glad to see these pictures as a reminder of my trip to India three years ago and a reminder to return, but with my family this time. Was that a American flag steps in one of the pictures? These are your best shots yet. You have a great sense of scope and scale in these. Really well done. Thanks, Michael. 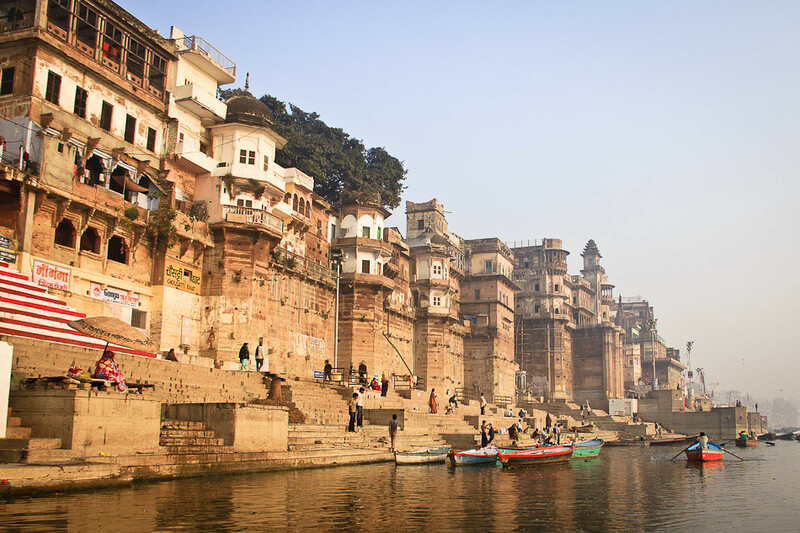 Varanasi is a real contrast — in the Old City, the alleys are narrow and dark. Then you reach the Ganges and the sky just knocks you over. Wow, wow, wow!! 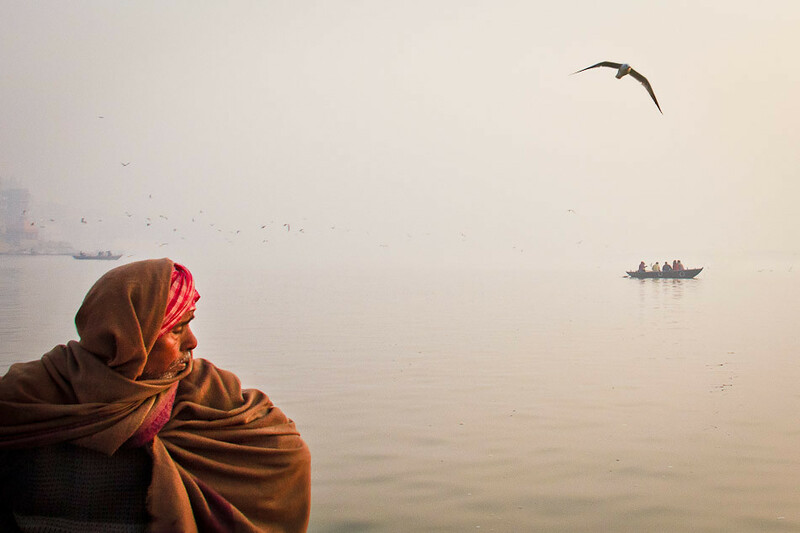 Your photo essay of life on the Ganges River is absolutely stunning. 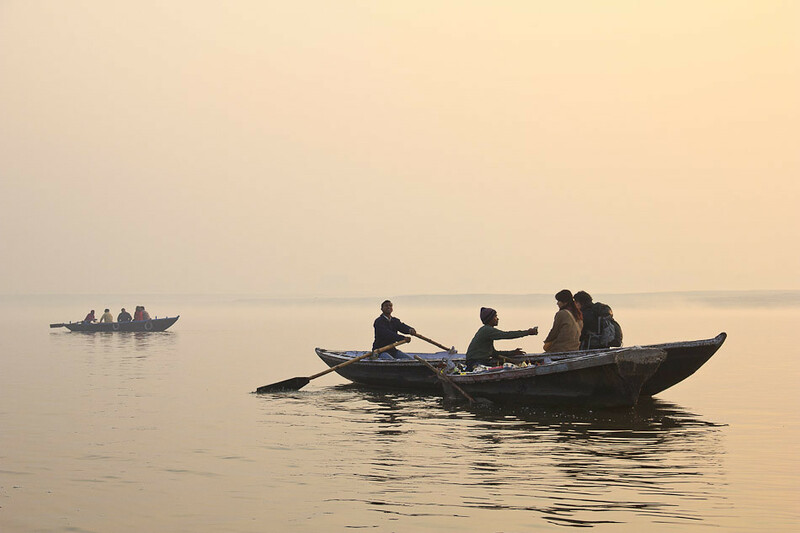 Thanks for sharing your travels to Varanasi, India. Thanks for the kind words, Kelly. Gorgeous! Such a beautiful place to photograph! I pretty much only have one word: WOW! These are beautiful, and it looks as though you’ve done a good job capturing the spirit and feeling of the place. Amazing shots! Thanks, Amanda! Very kind of ya. Stunning real life people shots, Wes! Thanks, Abby. Happy New Year! Wow Wes, when did you turn into such a kickass photographer?! Great post! Absolutely beautiful. Wow — thank you for sharing these! Ha ha! I saw a couple of people stuck in your situation. I watched one boat from the shore for ten minutes and the thing never moved, despite the poor guy rowing his heart out. These are absolutey breathtaking BREATHTAKING photos, Wes. Stunning. Should be in National Geographic. Very nice work, i was wondering how bad the crowds of tourists are over there? Tourism seems to be down all over India. The attacks in ’08 really hurt the industry and it doesn’t seem to have recovered yet. I’ve only been turned away from a full hotel once or twice in two months. Nice pictures, but do a google search of Ganges and garbage and dead bodies and you’ll see the river as it really is, a real cess pool. Yeah, the river is filthy but it’s cleaner than it was 10 years ago. The city was cleaner as well. Still a long ways to go, but they’re making an effort. Wes, these are really incredible!! Thanks for sharing!! You know as I look at these pictures , they really would make awesome post cards , and if not than a set of post cards , which would be even better. Really nice tranquil feelings , And Peace full . thanks for re tweeting it. Thanks, Chris! I’m hoping to offer prints soon. Of course … you cover the transport, I’ll cover the beers. Holy cow, these are gorgeous! I’m especially impressed with the ones of people–I’m such a chicken with people shots. Although I only have a point-and-shoot, so I don’t have any photog street cred to really make it look like I should be taking pictures of people. Thanks, Megan. Actually, I think point-n-shoots are better for people shots. They’re more casual and friendly. When people see the big SLR, they tense up. I love the colors in these photos — especially the light pink shades of the sky and water. 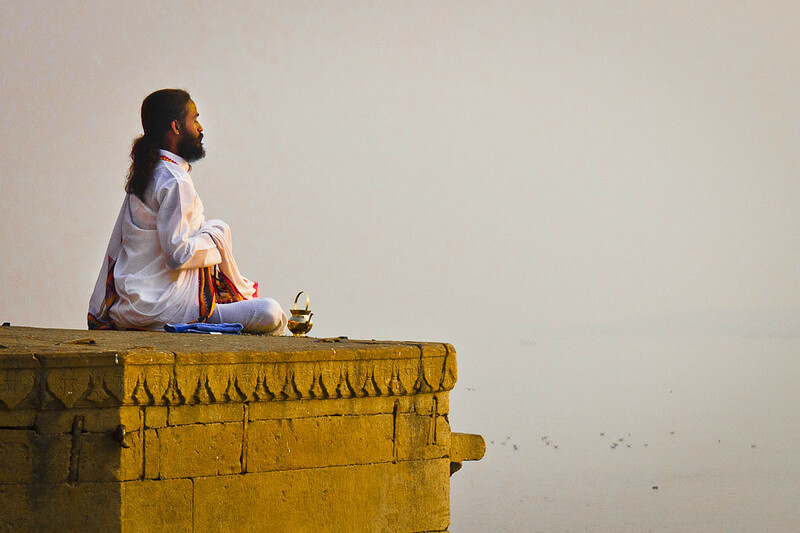 There is no place like Varanasi/ Benares!!! The only things missing are the pics of the burning ghats and the rotting water buffaloes upriver from the washing ghats and dhobi whallas!!! Wow, the second shot with the birds and the boat is perfect! AMAZING photos! These are just fantastic. India is my favorite place on earth. It can be hard travel but it’s equally rewarding. Thanks for the comment. 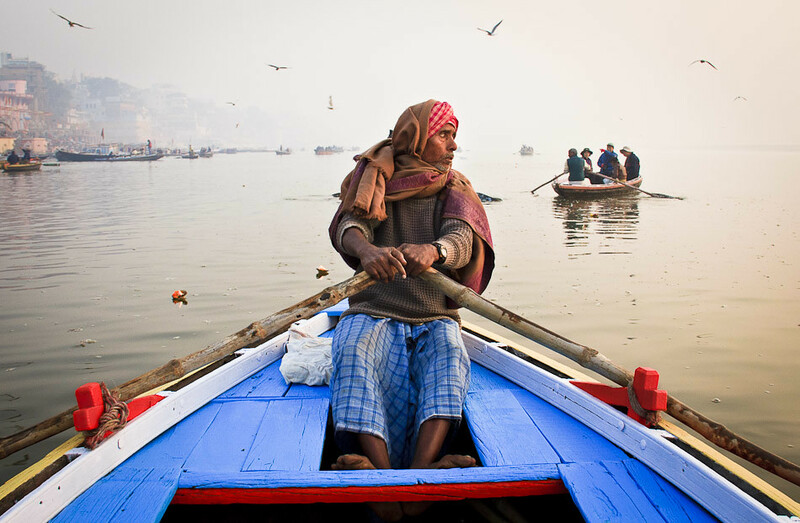 Superb photography Wes, and I am glad I found your post and learn that Varanasi is the place to go to for all things Ganghes related. Yeah, it’s incredible. Especially for photography. Beautiful photos. Thank you for sharing. I love the shot of the guy in the boat-the blues look amazing! The colors in the morning are incredible. The haze and smog hide the sun until about 10am, but as a result you get this really diffuse, warm light. Perfect for photos. Some beautiful images there… I especially like the one of the man praying. Nice work! Man! 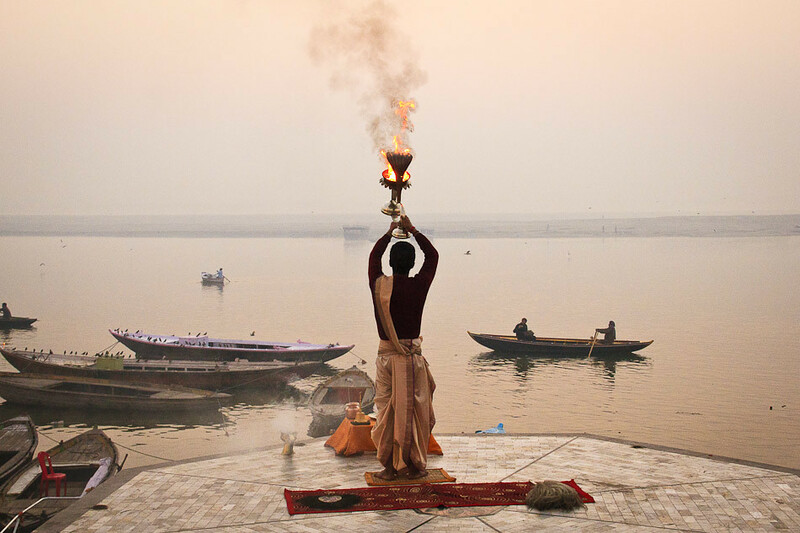 I believe I met you in Varanasi someday around 1/3~1/4! If that’s really you, I should say the world is small.